Back in November, Diana and I were in the Jacksonville, Florida, area. At that time of year, we don’t see butterflies in Minnesota, but in Florida they are still plentiful. 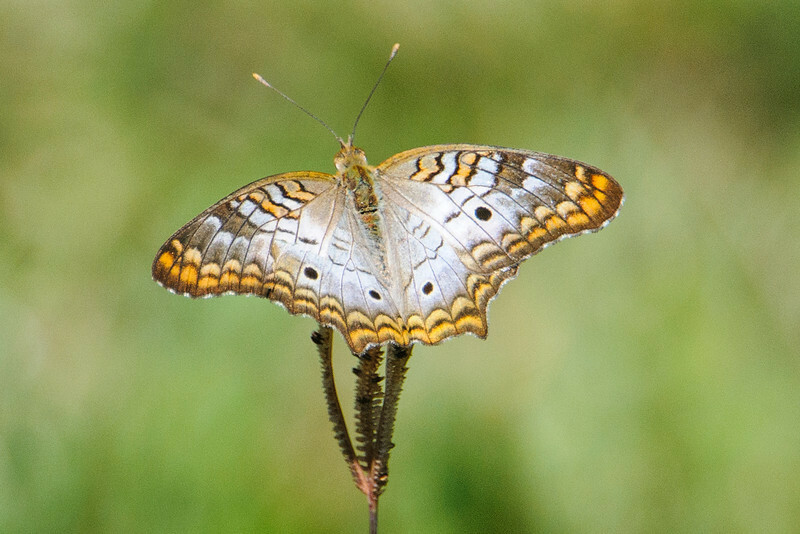 This is a White Peacock butterfly and it can have a wing span of 2 to 2¾ inches (the ones seen in summer are larger.) It’s a southern species and most sightings in the United States come from Florida and Texas. The complete range goes through Central and South America as far as Argentina. 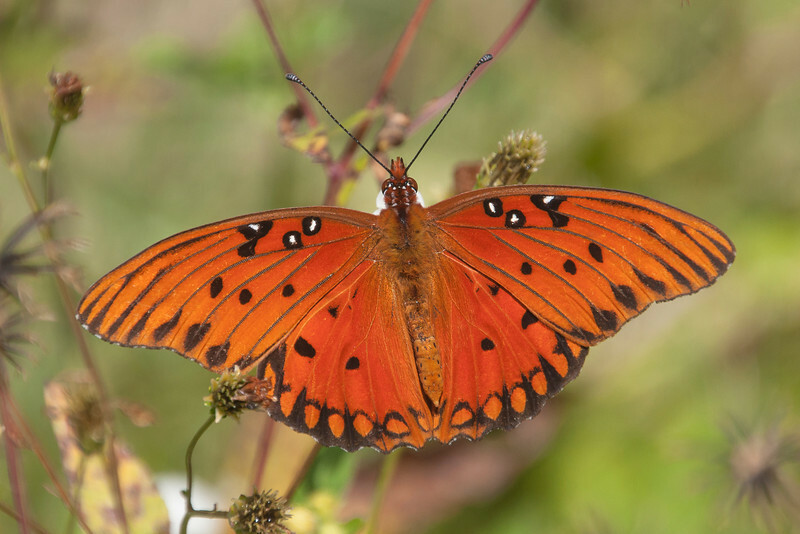 Here’s a common Florida butterfly called a Gulf Fritillary. This species is found over most of the southern half of the United States. Its range extends through Mexico, Central America, and into South America. It’s a fairly large butterfly with a wingspan of 2½ to 3¾ inches. 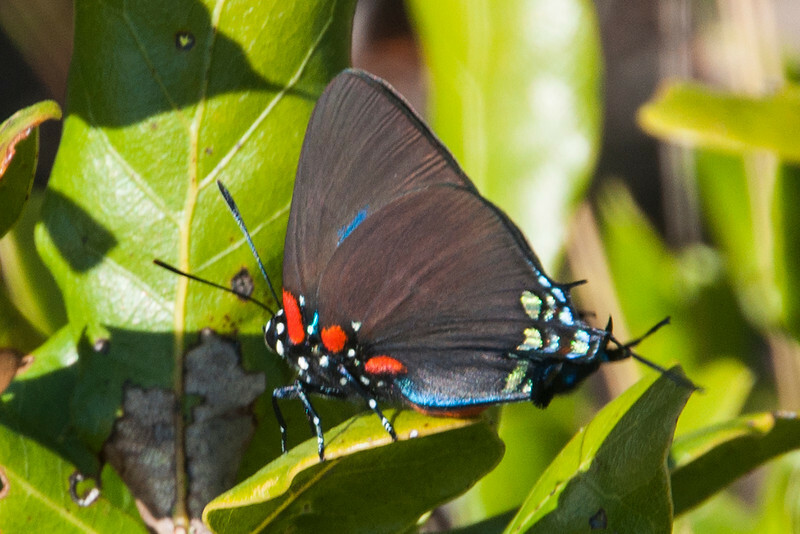 This beautiful butterfly is a Purple Hairstreak. With a wing span of 1¼ to 2 inches, it’s smaller than the previous butterflies. It is also found across the southern half of the United States and as far south as Guatemala. I read that it especially likes mistletoe as a host plant. 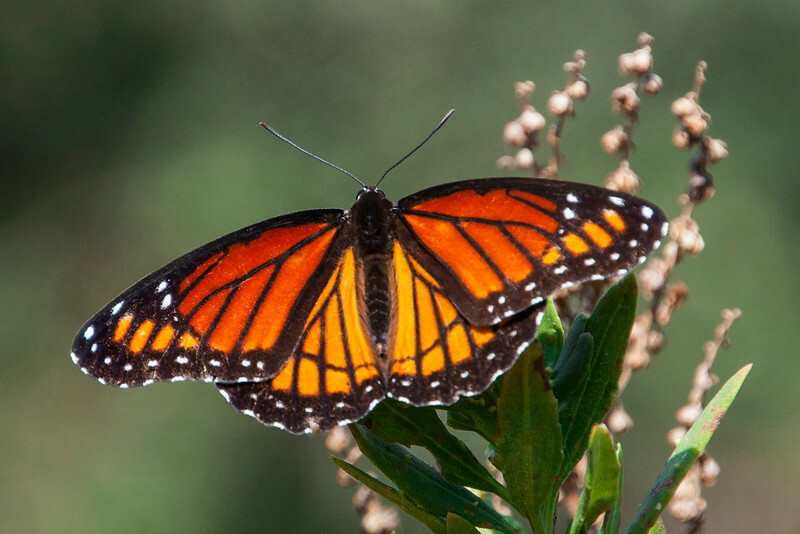 Monarchs are a common sight throughout North America. They are especially famous for gathering in huge numbers at wintering areas in California and Mexico. The Viceroy looks a lot like a Monarch butterfly. One way to tell them apart is to look for the thin dark line running horizontally across the hind wings of the Viceroy. The Monarch does not have this mark. 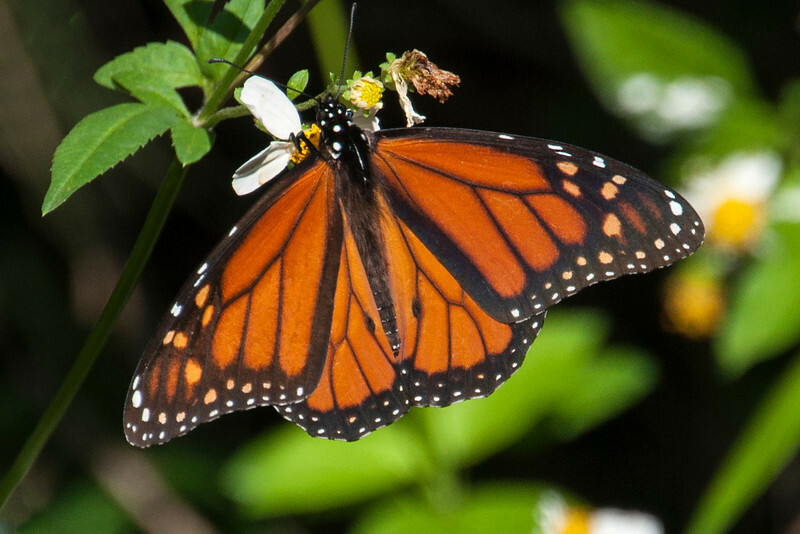 But, because it resembles the distasteful Monarch, the Viceroy is less likely to be attacked by predators. Viceroys are found all across the United States. 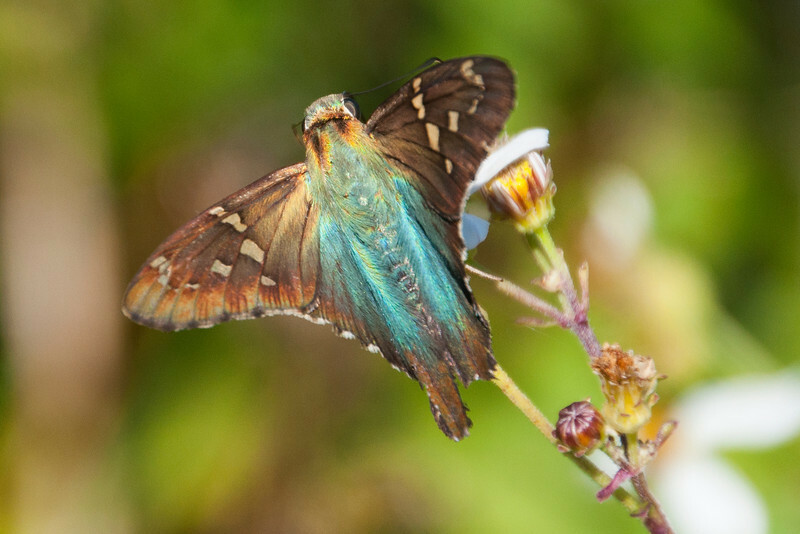 This Long-tailed Skipper is missing part of one “tail.” The iridescent blue coloring makes this an easy species to identify. It can have a wing span of 1 ¾ to 2 5/16 inches. In the United States, it is found mostly in the southeastern part of the country. You’re right, this is not a butterfly. 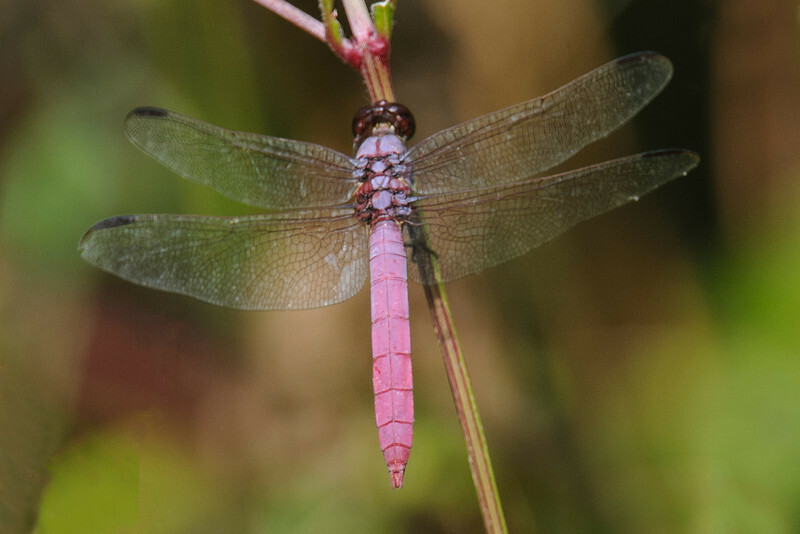 But this Roseate Skimmer dragonfly is so distinctive that I just had to include it. The rosy pink abdomen indicates this is a male (a female would be golden instead.) Roseate Skimmers are found across the southern United States from Arizona to South Carolina.